We are often reproached for accepting as a label this word anarchy, which frightens many people so much. "Your ideas are excellent", we are told, "but you must admit that the name of your party is an unfortunate choice. 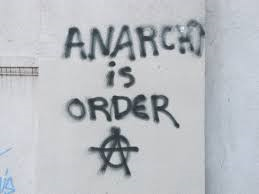 Anarchy, in common language, is synonymous with disorder and chaos; the word brings to mind the idea of interests clashing, of individuals struggling, which cannot lead to the establishment of harmony". Let us begin by pointing out that a party devoted to action, a party representing a new tendency, seldom has the opportunity of choosing a name for itself. It was not the Beggars of Brabant who made up their name, which later came to be popular. But, beginning as a nickname - and a well-chosen one - it was taken up by the party, accepted generally, and soon became its proud title. It will also be seen that this word summed up a whole idea. And the Sans-culottes of 1793? It was the enemies of the popular revolution who coined this name; but it too summed up a whole idea - that of the rebellion of the people, dressed in rags, tired of poverty, opposed to all those royalists, the so-called patriots and Jacobins, the well-dressed and the smart, those who, despite their pompous speeches and the homage paid to them by bourgeois historians, were the real enemies of the people, profoundly despising them for their poverty, for their libertarian and egalitarian spirit, and for their revolutionary enthusiasm. It was the same with the name of the Nihilists, which puzzles journalists so much and let to so much playing with words, good and bad, until it was understood to refer not to a peculiar - almost religious - sect, but to a real revolutionary force. Coined by Turgenev in his novel Fathers and Sons, it was adopted by the "fathers", who used the nickname to take revenge for the disobedience of the "sons". But the sons accepted it and, when they later realised that it gave rise to misunderstanding and tried to get rid of it, this was impossible. The press and the public would not describe the Russian revolutionaries by any other name. Anyway the name was by no means badly chosen, for again it sums up an idea; it expresses the negation of the whole of activity of present civilisation, based on the oppression of one class by another - the negation of the present economic system. The negation of government and power, of bourgeois morality, of art for the sake of the exploiters, of fashions and manners which are grotesque or revoltingly hypocritical, of all that present society has inherited from past centuries: in a word, the negation of everything which bourgeois civilisation today treats with reverence. It was the same with the anarchists. When a party emerged within the International which denied authority to the Association and also rebelled against authority in all its forms, this party at first called itself federalist, then anti-statist or anti-authoritarian. At that period they actually avoided using the name anarchist. The word an-archy (that is how it was written then) seemed to identify the party too closely with the Proudhonists, whose ideas about economic reform were at that time opposed by the International. But it is precisely because of this - to cause confusion - that its enemies decided to make use of the name; after all, it made it possible to say that the very name of the anarchist proved that their only ambition was to create disorder and chaos without caring about the result. The anarchist party quickly accepted the name it has been given. At first it insisted on the hyphen between an and archy, explaining that in this form the word an-archy - which comes from the Greek - means no power and not disorder; but it soon accepted the word as it was, and stopped giving extra work to proof readers and Greek lessons to the public. So the word returned to its basic, normal, common meaning, as expressed in 1816 by the English philosopher Bentham, in the following terms: "The philosopher who wished to reform a bad law", he said, "does not preach an insurrection against it.... The character of the anarchist is quite different. He denies the existence of the law, he rejects its validity, he incites men to refuse to recognise it as law and to rise up against its execution". The sense of the word has become wider today; the anarchist denies not just existing laws, but all established power, all authority; however its essence has remained the same: it rebels - and this is what it starts from - against power and authority in any form. Let us however make sure we understand one another - what order are we talking about? Is it the harmony which we anarchists dream of, the harmony in human relations which will be established freely when humanity ceases to be divided into two classes, one of which is sacrificed for the benefit of the other, the harmony which will emerge spontaneously from the unity of interests when all men belong to one and the same family, when each works for the good of all and all for the good of each? Obviously not! Those who accuse anarchy of being the negation of order are not talking about this harmony of the future; they are talking about order as it is thought of in our present society. So let us see what this order is, which anarchy wishes to destroy. Order today - what they mean by order - is nine-tenths of mankind working to provide luxury, pleasure and the satisfaction of the most disgusting passions for a handful of idlers. Order is poverty and famine become the normal state of society. It is the Irish peasant dying of starvation; it is the peasants of a third of Russia dying of diphtheria and typhus, and of hunger following scarcity - at a time when stored grain is being sent abroad. It is the people of Italy reduced to abandoning their fertile countryside and wandering across Europe looking for tunnels to dig, where they risk being buried after existing only a few months or so. It is the land taken away from the peasant to raise animals to feed the rich; it is the land left fallow rather than being restored to those who ask nothing more than to cultivate it. Order is slavery, thought in chains, the degradation of the human race maintained by sword and lash. It is the sudden death by explosion or the slow death by suffocation of hundreds of miners who are blown up or buried every year by the greed of the bosses - and are shot or bayoneted as soon as they dare complain. Finally, order is the Paris Commune, drowned in blood. It is the death of thirty thousand men, women and children, cut to pieces by shells, shot down, buried in quicklime beneath the streets of Paris. It is the face of the youth of Russia, locked in the prisons, buried in the snows of Siberia, and - in the case of the best, the purest, and the most devoted - strangled in the hangman's noose. Disorder - what they call disorder - is periods during which whole generations keep up a ceaseless struggle and sacrifice themselves to prepare humanity for a better existence, in getting rid of past slavery. It is periods during which the popular genius takes free flight and in a few years makes gigantic advances without which man would have remained in the state of an ancient slave, a creeping thing, degraded by poverty. The word anarchy, implying the negation of this order and invoking the memory of the finest moments in the lives of peoples - is it not well chosen for a party which is moving towards the conquest of a better future?